IASCA Canada is proud to announce the EAST vs WEST CANADIAN FINALS happening in the month of AUG - Which is being judged by international judges for SQC and IQC. FOR IDBL we will be using the scores from Term Lab at both shows and whoever is the loudest in each class will be crowned Canadian Champion. Basically for those who cant make it to SBN in Daytona, we are now bringing those same judges to you. Thats right, We're bringing them to both shows on back to back weekends, from one side of the country to the other. The first show is happening in Coquitlam BC, and the second show is happening in Lindsay, ON. How it works for SQ is like this. For one fee your car will be judged for your own local show and prizes will be awarded for each class in the East and the West. 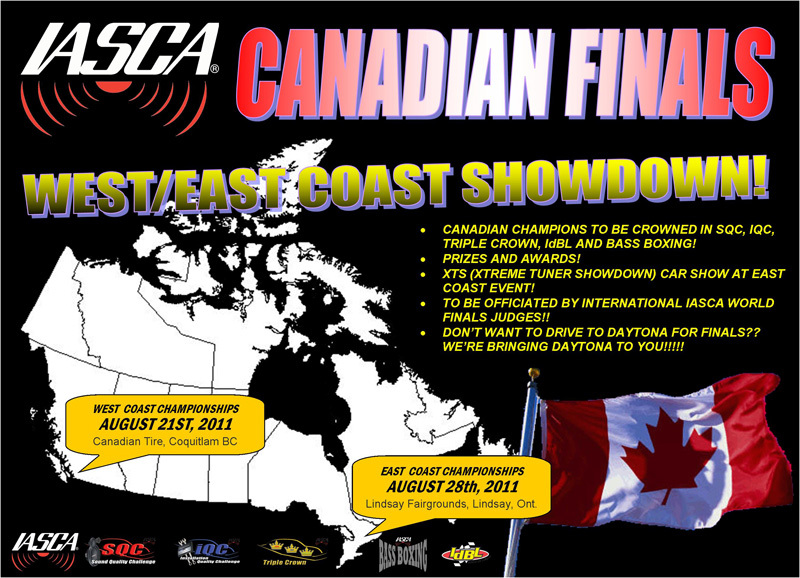 Your scores will then be used to determine who has the best overall score to be crowned Canadian Champion for 2011. There will be NO local judges, evaluating your systems at these shows....it is by far the most fair and non biased judging one could ask for at such a prestigious event. Once the Eastern Finals show is completed and tallied winners will be announced during the awards presentation and posted live via CCA, facebook, for all to see. Winners out west, of any Canadian Titles, will have there prizes sent to them (hopefully no more mail strikes)! Big rounds of applause go out to Keith from SoundsGood, Larry from Sound Solution, Moe from IASCA and our international judges for helping me make this happen. The EASTERN show is also the 3rd in a series of three shows with XTS. For any of you who have been to one of these shows now what the show has to offer and how big the shows are. More details will follow for the EAST show on a seperate thread and I am sure Keith will be doing the same for the WEST. Last edited by LarryW. ; 07-18-2011 at 05:24 PM. Sooooooo, why no exact date? Looks like I'll be there. Cant wait to be representing on the west ! I will be happy with however I do since this is my first year competing I have had a great time meeting the soundsgood shop's crew. I've got a bad reputation for never finishing a car!!! !